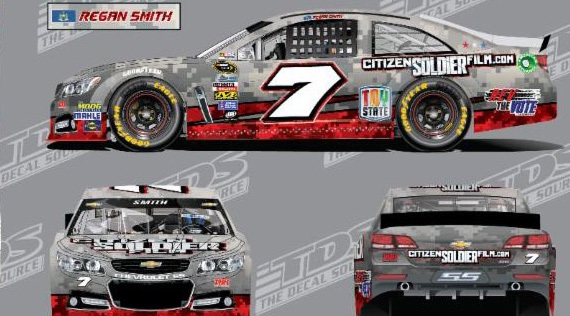 HUNTERSVILLE, NC (September 22, 2016) – “Citizen Soldier,” a feature film using real footage that follows an Oklahoma National Guard unit during its deployment to Afghanistan will be the primary sponsor for Regan Smith’s No. 7 Chevrolet at Dover International Speedway on Sunday, October 2. Produced by Strong Eagle Media and distributed by Gravitas Ventures and Broad Green Pictures, “Citizen Soldier” is a modern day “Band of Brothers” and documents the Oklahoma Army National Guard’s 45th Infantry Brigade Combat Team’s (nicknamed the “Thunderbirds”) 2011 deployment. Set in one of the most dangerous parts of Afghanistan at the height of the surge, it is a heart-pounding, heartfelt grunt’s-eye view of the war. The film tells the true story of an exceptional group of young soldiers and their life-changing tour of duty in Afghanistan, offering an excruciatingly personal look into modern warfare, brotherhood and patriotism. For Baldwin, this film hit home due to a relationship with United States Marine Corps Sgt. Derek Stevenin. Through Baldwin’s friendship with Derek, Tommy understood the trials he faced with serving five deployments in just eight years. This past Memorial Day, TBR honored Derek and 17 of his fallen brothers on the No. 7 car at Charlotte Motor Speedway. Tune in to the Citizen Solider 400 on NBCSN at 2:00 p.m. ET.